Poor quality of sleep affects us in all areas of our life. Did you know that one in three people have difficulty sleeping?! White Noise could be the Answer to All of Your Sleep Problems? Experts have discovered that broken sleep is in fact as detrimental to our body and our brain as having no sleep at all. Lack of sleep affects us both physically and mentally. When we are tired we experiences mood changes, we become more stressed, we have a lower tolerance for things that we ordinarily would be able to easily deal with. We can become irritable and have a reduced level of concentration. We find ourselves having short attention spans and we become less alert, this can lead to harm because our judgement becomes slow and impeded. Quite simply, without sleep, we do not function well at all. In a nutshell, it is a lack of or poor sleep. Its known that approximately one third of us do not get as much sleep as we would like or need! Do you often wake up before you are supposed to? Do you find yourself waking up during the night? Do you sometimes not feel refreshed even after a nights sleep? While insomnia itself is a medical condition, many people are suffering from poor sleep simply because of the environment they’re living in. Wow! What this means is that you can make a difference, you can make changes to help you achieve a good night sleep. Did you know up to 70% of people are biologically hard wired not to be able to sleep through distracting sounds at night? If noise pollution such as barking dogs, garbage trucks, noisy neighbours or your partners snoring keep you awake at night, it may be time to consider investing in a white noise generator. White noise is a specially crafted sound byte, which is used to drown out all background noises. It works by restoring a sound equilibrium, which means that it will help reduce them amount of noise around you that grabs your attention, and steals your sleep! Noises that commonly prevent you from falling asleep, or that cause you to wake up in the night are masked by a calming background shhhhhhh. Sounds that commonly annoy us including tinnitus, disappear from our hearing, resulting in a long, restful sleep. True white noise can only be created electronically. Devices such as the Dohm Dual Speed have been specially engineered to create the exact frequency needed to normalize external sounds. While other similar sound masking devices are on the market such as white noise apps, only machines designed to play the ‘shushh’ sound on a no-loop, no recording playback will be truly effective for banishing unwanted disturbances. Your bedroom should be a relaxing place for you to drift off to sleep. Noise is a big contributing factor when it comes to lack of sleep. Eliminate noise from you bedroom and improve your sleep. Use earplugs to block out unwanted noise from outside sounds and or snoring partners. The temperature of your room can create a favourable sleep environment. If your room is either too hot or too cold, it could impact your slumber. Use fresh breezes, a fan or air conditioning to keep cool on those warmer nights and make sure you have extra bedding or heating during the colder months. Managing the light in your bedroom can help with a peaceful night sleep. When going to sleep, always ensure that your room is dark. Dim the lights and turn off electronic devices. Hide your clock! One… it makes for a bright light to wake & disturb your sleep through the night & two… at times when you wake before you are scheduled to you may find yourself laying awake longer watching the time or thinking about how long you have until you wake. Digital clocks increase your arousal level, this is not productive for relaxation or sleep at all. Make sure that you have blockout curtains or blinds. If your room is still not dark, wear a sleep mask! We have a fantastic range of light, comfortable eye masks that block out light to aid in a great night sleep without early morning wake ups! Being comfortable is imperative for a peaceful nights rest. Your bedding, including your mattress, pillow and linen should all be fresh, clean and most of all comfortable. After all, you spend a third of your life in bed! It’s easily worth warranting that you have ticked all the right boxes when it comes to quality bedding! 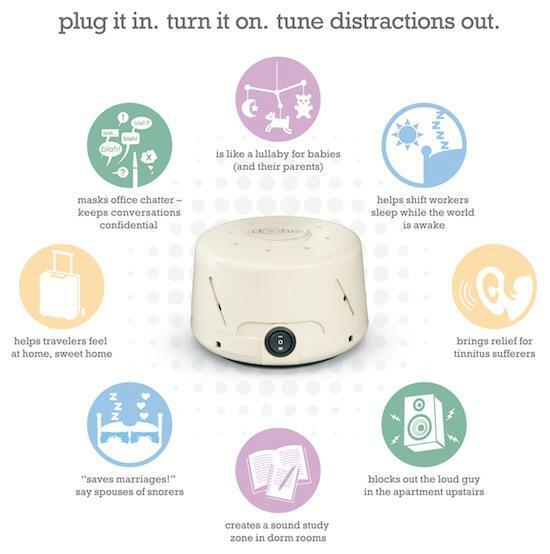 White noise machines can be used by anybody looking to drown out background noise or even silence. Age is not specific, nor is gender. We receive notes of thanks from men and women, young and old, from shift workers to uni students and the elderly. We have a large following of customers who love their Dohms for creating a “private” environment for patients and staff. Our sound machines are often used by Doctors, Solicitors, Psychologists, Managers etc to ensure conversations of a confidential nature are kept just that! At the end of the day the goal of the sound machine is easily achieved by helping to create a peaceful ambient noise allowing people to focus on what they’re doing. 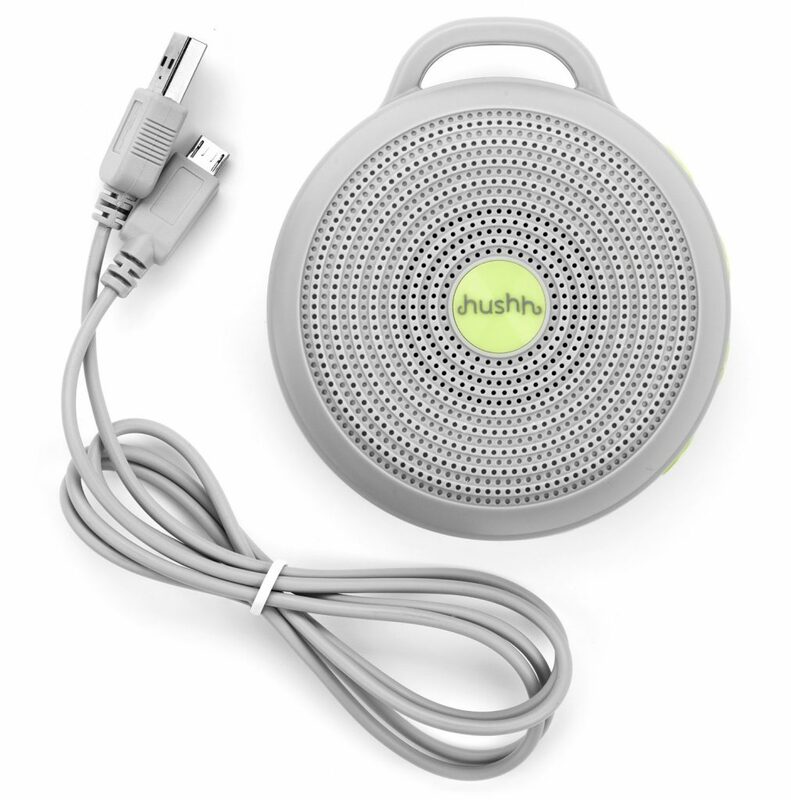 A 2008 Consumer Report study actually found that white noise machines were virtually as effective for problem sleepers as pharmaceutical sleep aids. This is definitely something, which has propelled them in to the limelight in recent years. 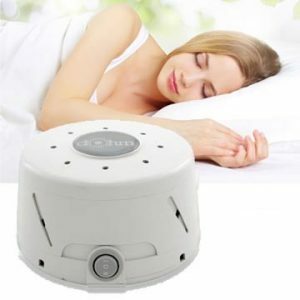 Therefore the white noise machines are frequently purchased by those wishing not to take anything medicinal or toxic to help them sleep. When Can I use a White Noise Sound Conditioner? Whenever there is sound you’d rather not to hear, that’s a perfect scenario for using a white noise generator. 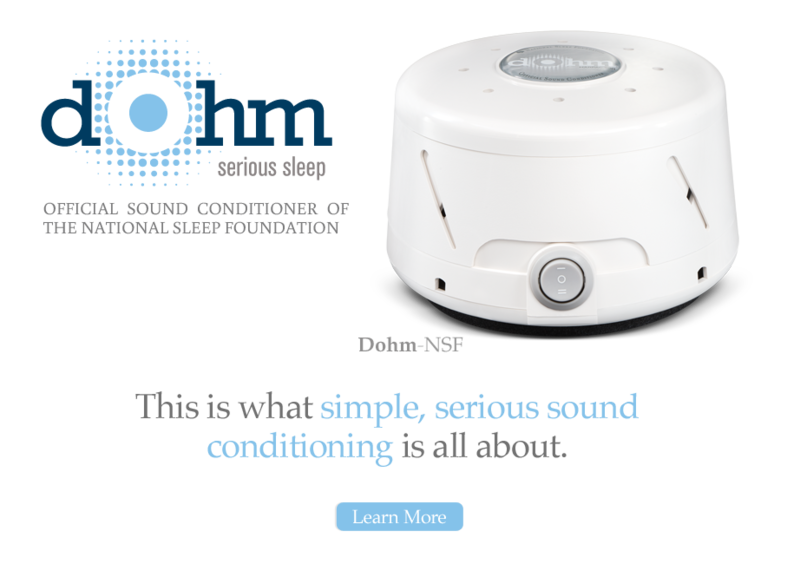 The Dohm DS White Noise Machine comes fitted with an 8 meter plug cable and a lightweight body, making it perfect for any use. It’s easy to keep beside the bed, and just as easy to take on a cruise ship. Offices, nurseries, bedrooms, college dorm rooms, hotel rooms and more, are all places you’ll frequently see white noise generators being used. 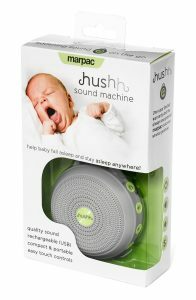 Now whats even more exciting is that Marpac, the world leaders in WHITE NOISE, have just released the HUSHH WHITE NOISE MACHINE & it is nothing short of brilliant!!! If you’re looking for something to help you sleep better, study better or block out background noise wherever you are CLICK HERE now. It’s time to find out what the machine named the Official Sound Conditioner of the National Sleep Foundation can really do for you.